In the summer of 1944 the Soviet Command decided to use clustered projectiles against the enemy armoured vehicles, and the PTAB 2.5-1.5 ‘cumulative’ aircraft bomb, developed under the leadership of I Larionov, was put into production. The small calibre bombs were loaded directly into the bomb bay and were dropped on the enemy vehicles from altitudes up to 328ft (100m). As each Il-2 could carry up to 192 bombs, a ‘fire carpet’ 229ft (70m) long and 49ft (15m) wide covered the enemy tanks, giving a high probability of destruction. This was important because the low accuracy of the Il-2’s bomb sight was one of its shortcomings. Pilots of the 291 st ShAP were the first to use the PTAB 2.5-1.5 bombs. In one operation on 5th June 1943 six attack aircraft led by Lieutenant Colonel AVitrook destroyed 15 enemy tanks in one attack, and during five days of the enemy advance the 291 st Division pilots destroyed and damaged 422 enemy tanks. 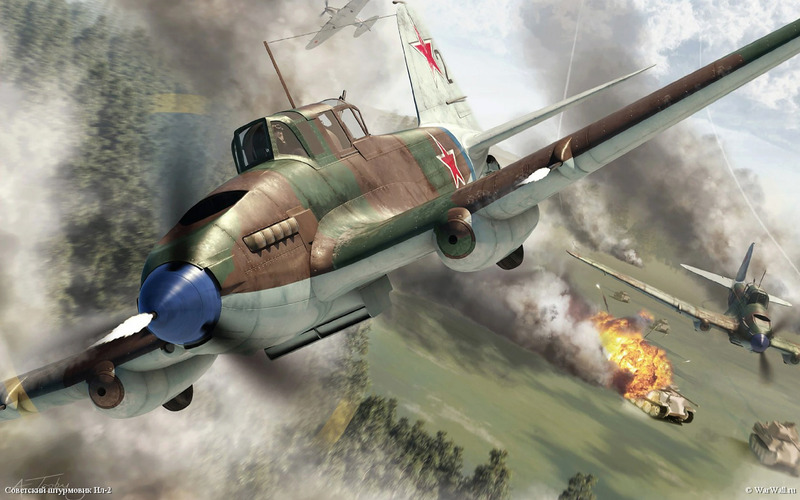 In the Battle for Kursk General V Ryazanov became a master in the use of attack aircraft en masse, developing and improving the tactics of the Il-2 operation in co-ordination with infantry, artillery and armoured troops. Ryazanov was later twice made a Hero of the Soviet Union, and the 1st Attack Aircraft Corps under his command became the first to be awarded a Guard title. However, the successes of attack aircraft combat operations were accomplished with great losses. The Luftwaffe Command claimed that the Russians lost 6,900 Il-2s in 1943 and 7,300 in the following year. Although these figures exaggerated the losses by a factor of 2 to 2.2, they were substantial nonetheless. In 1943 one loss corresponded to 26 Il-2 sorties, and to even fewer in certain operations. Approximately half of those lost were shot down by enemy fighters, the other half falling to anti-aircraft fire of ground-based guns. Assessing the main reasons for such great losses, the Air Force Commander, A Novikov, considered that poor training of the crews and units was not to blame, but attributed them to flawed tactical procedures in attack aircraft operation. On almost all fronts the pilots adopted a peculiar scheme of approaching the target at 3,300 to 4,900ft (1,000 to 1,500m) altitude without considering its nature, then gliding down and recovering after the attack with a turn, to port. The enemy therefore knew the ‘attackers’ manoeuvres beforehand, and prepared all of his anti-aircraft defences, taking full advantage of relief features, forest, bushes etc, before their appearance over the battlefield. The German Bf 109 and Focke-Wulf Fw 190 attacked successfully when the Il-2 gunners were inattentive and the formations were broken up. A damaged and lagging 11-2 often became the victim of fighters. However, attack aircraft pilots could sometimes use skilful defensive tactics, and gunners mastered aggressive fire techniques. The Il-2’s survivability was appraised in the 1st ShAP, and Ilyushin’s predictions were confirmed. As a rule the lower armour was not pierced, being hit by low calibre projectiles, and the cockpit also turned out to be effectively armoured. One pilot managed to land his Il-2 with only half of the elevator and rudder and with the port tailplane damaged as a result of anti-aircraft fire, and another landed without any covering on the wing centre section and with no flaps. The rear fuselage, outer wing panels and oil radiators suffered most from anti-aircraft fire. Sometimes the rear fuselage was insufficiently strong, and aircraft with metal outer wing panels appeared to have better chances of survival. Much attention was paid to eliminating these shortcomings. When deliveries of metal to the aircraft factories became regular, they began to build the aircraft with all-metal wings and to reinforce their rear fuselages with additional lengths of angle extrusions. These features were incorporated in Il-2s manufactured in the second half of 1944. The results were positive. An analysis of attack aircraft operation in the 3rd Air Army showed that irretrievable losses totalled 2.8 % of the number of sorties, and damage was sustained on half of the sorties. The ease with which the Il-2 could be mastered by pilots and technicians promoted its widespread use on all fronts. Pilot A Yefimov, twice Hero of the Soviet Union, remembered: ‘It was one of the most easily-mastered aircraft. There were no difficult instrument operations to distract the pilot from aiming at the target. The aircraft forgave the pilot even for flagrant errors. I do not know of a single case when an aircraft went out of control or entered a spin because of a pilot’s mistakes’. The Il-2 was widely used by the Soviet Navy’s air arm. An effective method of attack against shipping was to approach at a height of 100ft (30m) at about 250mph (400km/h) and drop the bombs so that they ricocheted off the water and destroyed the target vessel. Naval People’s Commissar N Kuznetsov considered this method, named top-machtovoe bombometanie, or mast-top bombing, to be approximately five times more effective than horizontal bombing. Lieutenant Colonel N Stepanyan was among the best attack aircraft pilots. On 14th December 1944 Stepanyan led 42 Il-2s of the 47th ShAP in an attack on Libava naval base. Together with Pe-2 bombers, the attack aircraft sank seven freighters and damaged six more. Thirteen Il2s were shot down, including the one flown by Stepanyan, who was posthumously proclaimed a Hero of the Soviet Union, his second such award. During the Second World War, 26 attack aircraft pilots flying Ilyushins were twice awarded the title of Hero of the Soviet Union. In conclusion, it is worth quoting the assessment of the Il-2 by the German infantry commander General von Sauken, Commander of the East Prussia Group in the final stages of the war. He wrote: ‘The effectiveness of Russian aviation activity in the Danzig region was enormous, and petrified the troops. Neither our air force nor our powerful artillery could oppose this air power’. Summer 1943. The German army prepares to launch its new offensive for the same ground where it had only months ago suffered its worst defeat of the war to date: The Southern Front. In the coming days, 6000 tanks, 4000 planes and two million soldiers would collide in what would become one of the most spectacular and brutal battles in all of World War II – The Battle of Kursk. The victories achieved by the Soviet Armed Forces during the Battle for the Volga and the later counteroffensive during the winter of 1942 had a considerable impact on the situation in the Soviet-German Front. The German High Command hoped for a decisive victory which would both soften the political consequences of the defeats suffered during the previous year, as well as wiping out a large number of Soviet units, weakening the entire Russian front. Betting heavily on German technological superiority to improve their odds of a victory, the Germans rushed large numbers of the new heavy Tiger and Panther tanks, and self-propelled Ferdinand vehicles into the theater. In addition to huge numbers of armored vehicles, the Germans looked to the use of combined air and ground power as a force multiplier. 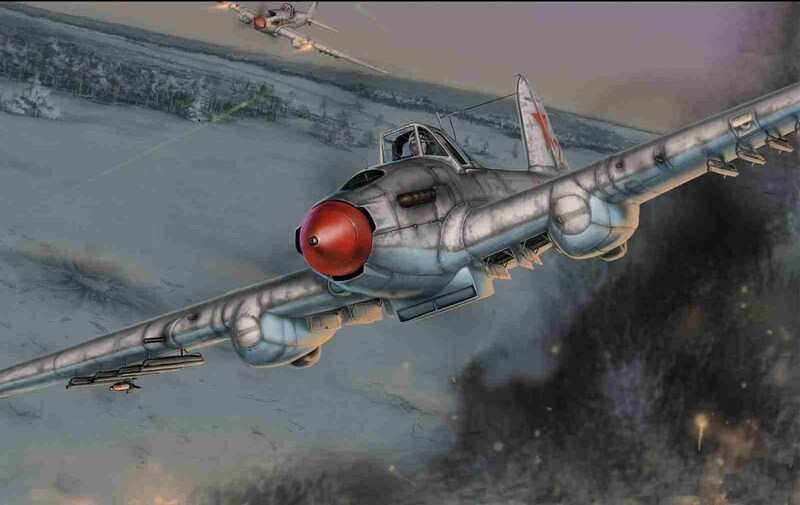 From all over Fortress Europa, the Germans drew the best squadrons available and poured them into the airfields of Oriol, Belgorod and Jarkov. In all, 17 squadrons, comprised of more than 1800 planes, were assembled. An additional 200 bombers were stationed in the rear guard airfields. The total commitment of the Luftwaffe numbered some 2000 aircraft – about 70 % of its total strength. The Soviets, aware of the German plans, sought to protect their ground troops with air cover assembled from units from other fronts, even from the reserves of the Supreme High Command General Headquarters. The Soviet Army gathered 3000 aircraft, roughly doubling the enemy in fighter planes. As the battle raged, wave after wave of Stukas attacked the Soviet armored vehicles, while the Russian planes did the same to the German Panzers. The Luftwaffe attacked industrial sites and communication centers, while the Soviet attacks focused on airfields and ammunition deposits. In a radius of 20 to 60 Kilometers, some 2000 planes engaged in aerial combat involving from 100 to 150 machines at a given time. On July 20th 1943, facing the possibility of Wehrmacht units being cutoff or trapped, and fearing a repeat of the scenario that took place at Stalingrad, Hitler called off “Unternehmen Zitadelle” (Operation Citadel) and the German divisions retreated to a safer position, but not before German forces had suffered huge losses of irreplaceable crews and equipment.